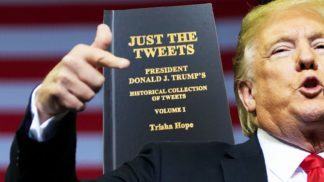 Get Your Copy of “JUST THE TWEETS” Volume I Today Before Supplies Run Out! 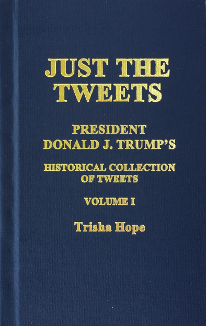 Watch KPRC Houston’s Channel 2 News interview with Trisha Hope, author of “JUST THE TWEETS”… A Collection of President Trump’s Historic Tweets (above). Listen to Mike Gallagher’s nationally syndicated radio interview with Trisha Hope author of “Just The Tweets” (above). 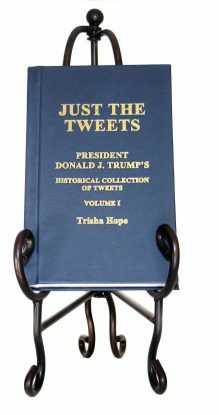 “JUST THE TWEETS”: Volume I covers President Donald J. Trump’s Tweets posted from his personal Twitter Account during his first year in office. “JUST THE TWEETS” VOLUME I…is a “Historic, Chronological Archive” of President Donald J. Trump’s first year in office, via the tweets, posted from his @realdonaldtrump Twitter account. In Volume I President Trump begins his fight to “Make America Great Again” despite staggering “Deep State” opposition. …Discover the immense corruption and bias embedded in our government and main stream media at the highest levels. …Realize (if you haven’t already), Donald Trump is a marketing and strategic genius as he out markets and out maneuvers the “Trump Haters” at their own game. …Realize President Trump was right about many things for which he was criticized.